PILKE plywood lamp family consists of five pendant lamps, a table lamp and floor lighting. Pilke 28 pendant has a diameter of 28 cm. There are three colour options: natural birch, white and black stain. Green GOOD DESIGN Award 2016. 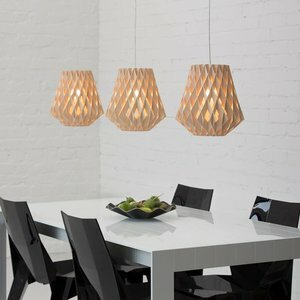 The PILKE lights are assembled of numerous plywood parts in a way which brings together traditional Finnish handicrafts technique and ultramodern computer geometry. No glue or screws are needed. PILKE is a unique, decorative lamp, giving natural warm light through its wooden structure. The word PILKE is a Finnish word for TWINKLE.